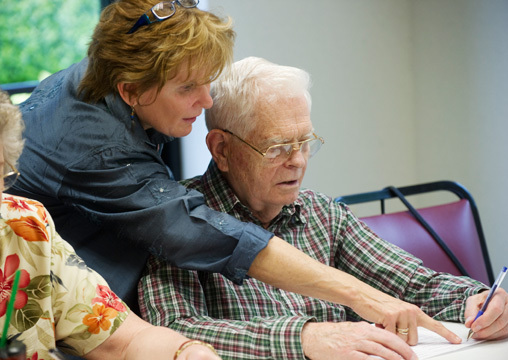 Lin Buettner, center, helps residents of Friends Home West work on a memory test during one of the 24-session classes designed to treat apathy in the early stage memory loss program. In spring 2010, professor and researcher Dr. Linda Buettner earned her most recent and prestigious award – the 2010 Barry Reisberg Award for Non-Pharmacologic Research, Theory, and Clinical Practice. This award honors an accomplished clinician and researcher each year for their distinguished contributions to the field of non-pharmacologic Alzheimer’s disease treatment and care. For the past 15 years, her research has centered mostly on the examination of therapeutic programs for older adults with secondary symptoms of dementia, depression, delirium and evaluating non-pharmacological interventions. In May, Buettner traveled to New York City to present a lecture at the public awards ceremony. The award and lecture were jointly sponsored by Forest Laboratories and The Hearthstone Alzheimer’s Foundation, which promotes primarily non-pharmacologic approaches (e.g., environmental design, therapeutic gardens, caregiver communication training, family awareness, family participation in caregiving, alternative health care, diet, exercise, music, art, etc.) to treatment for the millions of people coping with Alzheimer’s.